22 Oct 2018 --- Unilever has launched its version of a better-for-you healthy ice cream with probiotics and protein. 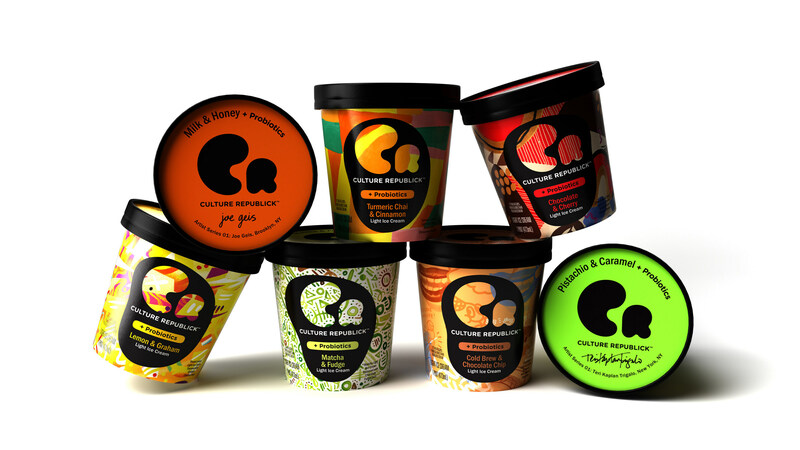 New brand Culture Republick is a low-calorie alternative in the increasingly popular healthy ice cream category which saw Halo Top scoop US grocery sales last year, taking market share away from iconic giants Ben & Jerry’s and Häagen-Dazs. Unilever is also promoting “culture inside and out” with its premium probiotic ice cream brand by collaborating with emerging artists. Local artists can use the label as their canvas, designing and decorating on-pack artwork, complete with their signature and information. Ten percent of the brand's profits will support the arts in local communities with all charitable donations made possible by the Unilever Foundation. Each pint contains three billion live active cultures, 400 – 500 calories, 16 – 18 grams of protein, 11 – 12 grams of fiber and no artificial sweeteners. Flavor varieties include Milk & Honey, Turmeric Chai & Cinnamon, Cold Brew & Chocolate Chi, Pistachio & Caramel, Lemon & Graham, Chocolate & Cherry and Matcha & Fudge. Chocolate & Cherry and Matcha & Fudge. The Culture Republick brand launch closely follows Unilever presenting its vegan ice cream in the Swedish and Finnish markets in August when dairy-free Magnum bars made their debut. The ice cream bars are made from a pea protein base and covered in smooth dark chocolate. When Unilever announced its results for the first half of 2018, the company said that ice cream delivered strong growth driven by innovations behind its premium brands, including the launch of Magnum Core & Praliné variant and the roll-out of the Ben & Jerry’s non-dairy platform from the US into Europe. The new Kinder ice cream, launched after partnering with an Italian confectioner, had a very promising start in Germany and France, it added. The dairy alternatives market has been a particular beneficiary of the trend in plant-based new product development. Plant-based product claims have increased by 62 percent globally from 2013 to 2017, according to Innova Market Insights. At the same time healthy ice cream category has been gaining in popularity following the launch of Halo Top – marketed as the first ever “lifestyle” ice cream that can be eaten daily without overwhelming a typical caloric intake diet – in 2012 and which was hailed as the best-selling ice cream pint at US grocery stores last year. 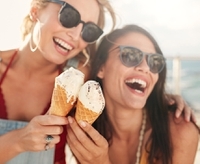 Dutch ice cream brand Koupe also joined the market with its high-protein offerings and Arctic Zero with its plant-based, low-calorie ice cream. Culture Republick is on sale at select US retailers for an average price of US$3.99 to US$4.99 and is pushing its “unique connection to the arts” as a stand-out mission. As knowledge of the gut microbiome increases, probiotics have experienced a huge surge in popularity. Earlier this year, FoodIngredientsFirst sister publication NutritionInsight explored the growth in this category, the importance of scientific research for probiotic strains, growing market applications and novel delivery forms. You can read more on this here.